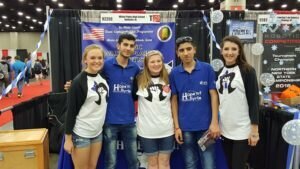 The REC Foundation recently caught up with Team 9225C, Wildcat Robotics from White Plains High School in Anniston, Alabama. Team members include Alexis, Rebecca, Rachel, Chase, and their coach Bo Shaw. 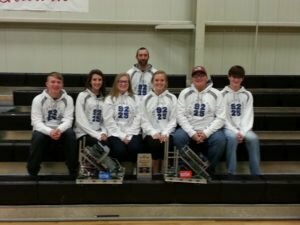 In response to their success, the team was recognized at a school committee meeting, and the Calhoun County Board of Education is taking steps to provide start up funds to schools seeking to start new robotics teams to students in elementary, middle school, and high school and also provides teacher stipends for their efforts. Chase, who has graduated high school, says that robotics competitions have shown her how people can come together to accomplish something. She received the first scholarship for robotics at Jacksonville State University and looks forward to joining a college robotics team there. The team’s coach, Jonathan Shaw, has been an inspiration to the girls as well. “I realized that many young women may be interested in robotics, but at the same time are intimidated by the environment,” said Mr. Shaw. “It’s important for coaches to encourage them and teach them how to use the tools they’ll need and break down the parts we use to build a robot. 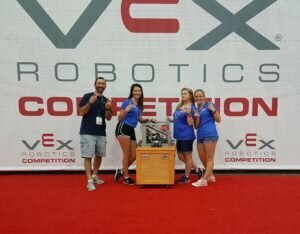 We make mistakes together and the girls listen and take the advice and encouragement they receive to heart.” Mr. Shaw recognized early on with his teams that it’s critical to show the students, girls or boys, that you believe in them and their ability and are passionate about the robotics program you manage. The team has visited other schools to share their experiences, give advice, and encourage students to pursue robotics.